Give him tummy time since he’s born. Practicing this helps your baby develop strong neck, shoulders, arms, and legs muscles and promote his crawling abilities. Lying face down might make your little one fussy; it’s okay. Try taking breaks or laying him over your chest or belly and make funny faces to make spending time on his tummy more enjoyable. Tummy time also works best when your baby feels comfortable in the space, so try this in his room or somewhere he’s familiar with. Encourage him to reach for toys. While it might seem a very simple thing, reaching is a very important part of crawling. While your baby reaches for a toy, he learns that in order to get it, he needs to lean away from that arm. This creates a scenario in which he has a supporting arm and a reaching one. In this simple action, your baby is learning how to shift his body weight from side to side, an essential skill when crawling. Reduce the time he spends on his sitting chair, bouncer, or baby carrier. 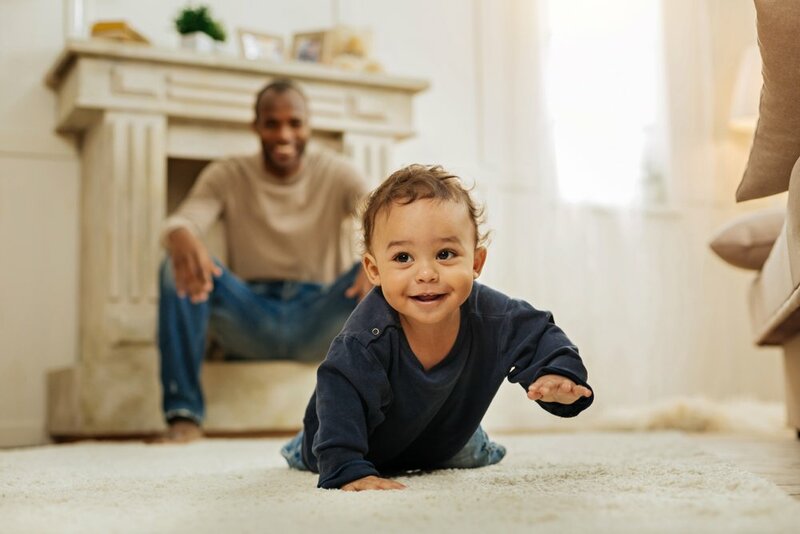 It’s nice to keep your little one safe but spending time on the floor with you is what really builds those muscles and encourages him to explore the world through movement. Around the same time your son is learning to push himself forward to crawl, he is also learning how to sit up. Make sure you make time for both sitting and rolling over, but also for pushing forward and changing positions. Tripod position is great to get him to build those back muscles, so try grabbing his attention with an attractive toy and moving it forward so that he has to change to all fours to reach it. Playing in front of a mirror can also get him curious to reach out of his sitting position and explore his reflection. As he becomes more agile, create miniature obstacle courses using pillows, boxes, and sofa cushions for him to crawl over and between. Remember to be by his side at all times since he might need your support for getting around an obstacle. Stairs are another obstacle course you can try, they’ll help him feel comfortable on all fours. If you have a staircase at home, he’ll probably be excited to explore it. Remember that, even though your little one needs to learn how to go up and down that stairs, you should not let him play there unsupervised. So, while you are not there, make sure the staircase is off limits for him. If you don’t have a staircase, you can always practice using a step stool, foam blocks, cushions, or even rolled carpets. Remember that there’s a wide window for your baby to learn how to crawl and that some babies skip crawling all together. Chances are you don’t need to worry. However, if you see your little one having trouble coordinating both sides of his body, it’s always best to consult with your pediatrician.